There are many resources for learning about OpenWhisk; this page attempts to organize, describe, index and link to the essential information, wherever it resides, to help users in getting started. In general, much of the best information is in the actual project repositories and we encourage you to seek detailed and in-depth information there. Developers: users developing functions/actions, creating packages, feeds, and feed provider services using project APIs, clients and tooling. Contributors: developers designing and coding backend architectural components and tooling that comprise the OpenWhisk platform and its project ecosystem. Operators: users who deploy, configure, and host the Apache OpenWhisk Function-as-a-Service platform for development, testing and/or production. Datastores, Message Queues, Mobile and Web Applications, Sensors, Chatbots, Scheduled tasks (via Alarms), etc. If you need languages or libraries the current "out-of-the-box" runtimes do not support, you can create and customize your own executable that run "black box" Docker Actions using the Docker SDK which are run on the Docker Runtime. This section will answer some of the essential questions about OpenWhisk Actions relative to the to the programming model. If you want to more detailed information, please read the project documentation on OpenWhisk Actions. What is an Action? Actions are stateless functions (code snippets) that run on the OpenWhisk platform. Actions encapsulate application logic to be executed in response to events. Actions can be invoked manually by the OpenWhisk REST API, OpenWhisk CLI, simple and user-created APIs or automated via Triggers which we will discuss later. Does the function's language matter? No, OpenWhisk is agnostic to a function's implementation language. This means that OpenWhisk operations used to create, invoke and manage Actions are the same regardless of implementation choice. You decide what languages are best for you! Multiple actions, even implemented in different languages, may be composed together to create a longer processing pipeline called a sequence. Sequence can be treated as a single action in terms of it creation and invocation. Namespacing - the same Namespace and Naming rules as any OpenWhisk Entity that are part of the OpenWhisk programming model. System Limits - Learn about some of the (operator configurable) System Limits that are imposed on OpenWhisk Actions. Web Actions - Find out how to annotate OpenWhisk Actions to quickly enable you to build web based applications. Action Processing - Find out what happens "behind the scenes" when you invoke an Action in Apache OpenWhisk. This section will describe how to automate OpenWhisk Actions in response to events using OpenWhisk Triggers. If you want to more detailed information, please read the project documentation on OpenWhisk Triggers and Rules. What is a trigger? Triggers are named channels for classes or kinds of events sent from Event Sources. What is a Rule? Rules are used to associate one trigger with one action. After this kind of association is created, each time a trigger event is fired, the action is invoked. Why do I need to connect actions to event sources? OpenWhisk is based on an event-driven architecture where most Actions are executed as events happen. The Trigger itself is "fired" with a dictionary of key-value pairs (i.e., the parameters) coming from the Event Source and allows the configuration of optional default values thus helping assure the data is compatible with any associated Actions. Rules allow for the same Trigger to be associated with multiple Actions, as well as allow for specific automation to be enabled or disabled dynamically without destroying the Trigger definition. The OpenWhisk project and programming model supports different kinds of developers that may wish to use different runtimes and tooling. This section contains the information and resources you need to become a Serverless application developer using the Apache OpenWhisk platform. You will need to have access to a running instance of the OpenWhisk platform to develop against. Developers can select to install and configure their own instance from among any of the options listed here: OpenWhisk Deployment Options. For local, "light weight" development, we recommend using Kubernetes enabled within Docker (i.e., Docker for Mac or Windows, Minikube for Linux). For setup instructions, see: Simple Docker-based options. Again, we encourage developers to leverage Cloud-based Kubernetes services to deploy OpenWhisk. Another option would be to use Serverless provider that already hosts Apache OpenWhisk and supports its Command Line Interface (CLI) such as IBM Cloud Functions. By default, local deployments of Apache Openwhisk create a guest account and endpoint for developers to use. However, if you are running on an instance of OpenWhisk administered by a Cloud provider, you will need to obtain an account and endpoint information from them. However, when running under a Kubernetes deployment installed using Helm, the endpoint's address and port are set in your "mycluster.yaml" deployment file. See the Deploy With Helm instructions for details. OpenWhisk offers the wsk Command Line Interface (CLI) to easily create, run, and manage OpenWhisk entities. For detailed information on setting up and configuring the OpenWhisk CLI, go to the OpenWhisk CLI documentation page in GitHub. To easily install the OpenWhisk CLI (wsk) you can use Homebrew for Mac or Homebrew for Linux. Then you can invoke the OpenWhisk CLI by just typing wsk from the command line. where you may select to download the CLI from the "latest" release or from one of the versioned releases. Uncompress the wsk executable from the tar.gz file. Simplify access to the wsk executable by moving or copying the binary file to a path listed in your PATH environment variable. This will enable you to invoke the OpenWhisk CLI by just typing 'wsk' on the command line from anywhere. Before using the OpenWhisk CLI, you must first configure it to point to the OpenWhisk platform you want the utility to use (i.e., its API endpoint) and also provide it with your associated authentication credentials. You can configure wsk CLI to use your OpenWhisk credentials in few different ways. See the Setting up the OpenWhisk CLI page for a full set of configuration options. The instructions below walk you through the simplest possible configuration using only an API_HOST and AUTH_KEY CLI properties using a default guest namespace. A simple "read" command will cause the CLI to authenticate to the OpenWhisk your configured API host endpoint and credentials. is incorrect. Verify your host connection and credentials using the wsk list command with the -v (verbose) flag enabled. You should see the full HTTP request and response headers the CLI sends/receives to/from the host along with the response codes. Whisk Deploy is a utility, named wskdeploy, to help deploy and manage all your OpenWhisk Packages, Actions, Triggers, Rules and APIs using a single command using an application manifest. Download and Install the wskdeploy utility for Linux, Mac or Windows. where you may select to download the utility from the "latest" release or from one of the versioned releases. Uncompress the wskdeploy executable from the tar.gz file. Simplify access to the wsk executable by moving or copying the binary file to a path listed in your PATH environment variable. This will enable you to invoke Whisk Deploy utility by just typing 'wskdeploy' on the command line from anywhere. Follow the instructions as shown for the Whisk CLI to learn how to do this for your development platform. Before you proceed with the deployment, please make sure you have setup the API_HOST and AUTH_KEY CLI properties with a default namespace as described in the Whisk CLI configuration section above. Please refer to the Whisk Deploy Programming Guide for all manifest file grammar and syntax. This programming guide has step-by-step instructions for deploying OpenWhisk applications using wskdeploy. Programming Guide - "wskdeploy utility by example"
Whisk Deploy - How to Sync OpenWhisk Projects between Client and Server? After your OpenWhisk environment is enabled, you can use OpenWhisk with your web apps or mobile apps with REST API calls. For more details about the APIs for actions, activations, packages, rules, and triggers, see the OpenWhisk API documentation. In this section, we will show you how to create and invoke your first "Hello World" Action using both the OpenWhisk CLI and the Whisk Deploy utility. Select from the language example you would like to follow from the list below. Let's look at how to write a sample hello world action in NodeJS. You can visit Creating and Invoking NodeJS actions page for further details. Note: We will be using wsk CLI in this section. If you don't have it installed and configured, please refer to the section OpenWhisk CLI (wsk). Note: We will be using wskdeploy in this section. If you don't have the binary, please refer to the section on Whisk Deploy to download it. OpenWhisk supports Node.js 10, Node.js 8, and Node.js 6 runtimes where Node.js 6 being default pick by wsk CLI and Whisk Deploy. If you wish to learn more about NodeJS runtime along with the libraries that are supported or "built-in" by default, please visit NodeJS Runtime GitHub Repository. Let's look at how to write a sample hello world action in Go. You can visit Creating and Invoking Go actions page for further details. msg["msg"] = "Hello, " + name + "!" Create a directory called actions with hello.go from step 1 above. If you wish to learn more about Go runtime along with the libraries that are supported or "built-in" by default, please visit Go Runtime GitHub Repository. Let's look at how to write a sample hello world action in Python. You can visit Creating and Invoking Python actions page for further details. greeting = "Hello " + name + "!" OpenWhisk supports Python 2 and Python 3 runtimes where Python 2 being default pick by wsk CLI and Whisk Deploy. If you wish to learn more about Python runtime along with the libraries that are supported or "built-in" by default, please visit Python Runtime GitHub Repository. Let's look at how to write a sample hello world action in Java. You can visit Creating and Invoking Java actions page for further details. OpenWhisk supports Java 8 runtime. If you wish to learn more about NodeJS runtime along with the libraries that are supported or "built-in" by default, please visit Java Runtime GitHub Repository. Let's look at how to write a sample hello world action in PHP. You can visit Creating and Invoking PHP actions page for further details. OpenWhisk supports PHP 7.3, PHP 7.2 and PHP 7.1 runtimes where PHP 7.3 is the default pick by wsk CLI and Whisk Deploy. If you wish to learn more about PHP runtime, please visit PHP Runtime GitHub Repository. Let's look at how to write a sample hello world action in Ruby. You can visit Creating and Invoking Ruby actions page for further details. name = params["name"] || "stranger"
OpenWhisk supports Ruby 2.5 runtime. If you wish to learn more about Ruby runtime, please visit Ruby Runtime GitHub Repository. Let's look at how to write a sample hello world action in Swift. You can visit Quick Swift Action page for further details. Create a directory called actions with hello.swift from step 1 above. If you wish to learn more about Swift runtime along with the libraries that are supported or "built-in" by default, please visit the project README Apache OpenWhisk runtimes for Swift. Let's look at how to write a sample hello world action in .NET Core. You can visit Quick .NET Core Action page for further details. If you wish to learn more about .NET Core runtime along with the libraries that are supported or "built-in" by default, please visit the project README Apache OpenWhisk runtimes for .NET Core. What is a package? In OpenWhisk, you can use packages to bundle together a set of related actions, and share them with others. OpenWhisk comes with a list of packages You can get more details on OpenWhisk packages here. Does OpenWhisk comes with any pre-installed packages? OpenWhisk comes with a list of pre-installed public packages which can be used by anyone. OpenWhisk has created a dedicated shared namespace /whisk.system for all the public packages. How do I invoke an action from a public package? There are two way to invoke an action from a package, (1) Invoking an action directly from a package (2) Creating a package binding and then invoking an action in the binding. "payload": "Hello, stranger from somewhere!" "payload": "Hello, Bernie from Vermont!" "payload": "Hello, Odin from Valhalla!" Where do I get more information on packages? Please read OpenWhisk Packages for further details. In this section, we will show how to automate Actions in response to events coming from Event Sources. Specifically, we will show how to create, fire and associate a basic Trigger with input parameters to an Action using a Rule. Firing a trigger like this currently does not do anything. We need to associate this trigger with an action. This kind of association is called a rule. Please make sure you have the hello action created. If not, you can follow instruction in the section above with the following hello.js. "payload": "Hello, Bernie from Vermont"
"payload": "Hello, Bob from NYC"
You can see that the hello action received the event payload and returned the expected string. OpenWhisk offers a catalog of packages which gives you can easy way to enhance your application with useful capabilities, and to access external services in the ecosystem. Examples of external services which are OpenWhisk-enabled include Slack, GitHub, Alarms, etc. incubator-openwhisk-package-alarm is an Apache OpenWhisk alarm package that can be used to create periodic, time-based alarms. incubator-openwhisk-package-cloudant enables you to work with a Cloudant database. incubator-openwhisk-package-kafka allows you to communicate with Kafka or Message Hub instances for publishing and consuming messages using native high performance Kafka API. incubator-openwhisk-package-rss allows users to subscribe to RSS/ATOM feeds and receive events when a new feed item is available. incubator-openwhisk-package-deploy offers a convenient way for you to describe and deploy any part of the OpenWhisk programming model using a Manifest file written in YAML. incubator-openwhisk-package-jira includes actions that interact with JIRA software software development tool used for issue tracking, and project management functions. incubator-openwhisk-package-template is a template for Openwhisk Packages, it can be used to build, test and integrate new packages. incubator-openwhisk-GitHubSlackBot demonstrates integration of GitHub Pull Request management with Slack and using Alarms. incubator-openwhisk-sample-matos demonstrates an implementation of a simple pipeline that reads messages from a Message Hub topic and archives them in batches into an Object Storage folder. incubator-openwhisk-sample-slackbot a proof-of-concept Slackbot to invoke OpenWhisk actions. incubator-openwhisk-slackinvite implements invitations for Apache OpenWhisk Slack Community. incubator-openwhisk-tutorial contains an interactive tutorials for the OpenWhisk CLI. incubator-openwhisk-workshop provides a series of exercises to help you understand how to use OpenWhisk to build serverless applications. incubator-openwhisk-debugger supports debugging OpenWhisk actions. The debugger will arrange things so that the actions you wish to debug will be offloaded from the main OpenWhisk servers and instead run locally on your laptop. You can then, from within the debugger, inspect and modify values. The Apache OpenWhisk project welcomes any and all developers to become a Contributor to any part of our project. Contributions can range from fixing documentation and adding testcases, to fixing bugs, proposing and implementing new features and reviewing others' Pull Requests (PRs). How do I become a Contributor or Committer? For convenience, here is a listing of current Apache OpenWhisk project repositories (by category). Note: OpenWhisk repositories follow a naming convention where all repo starts with incubator, for example, openwhisk-cli GitHub repository is named incubator-openwhisk-cli. Primary source code repositories including platform code, run books, tests and more. OpenWhisk supports several languages via Docker runtime containers. OpenWhisk can be deployed and configured on variety of platforms. OpenWhisk provides variety of tools around deployment and development. Few other misc. but crucial repositories. Usually, contributors come because they want to fix or improve some part of the project. This can include the code itself in any of the project repositories under our project, project documentation, test cases, literally anything! Fix open issues: both bugs and feature issues in GitHub. Improve Documentation: READMEs, Website Developer or Operator docs (Examples, How Tos), Medium blog articles, etc. Testcases (any repo. ): e.g., functional code coverage, performance, config. variants, parallelize test buckets, etc. Add/Improve Language Runtimes: See Contributing new Action Language Runtimes below. e.g., new languages, additional framework variants), etc. Improve tooling: Enhance CLI features, extend APIs for new use cases, etc. Feature ideas, Use cases, Design proposals: Support new scenarios, deployments (platforms), schedulers, etc. Submit ideas via our developer email list and use our Confluence Wiki to develop your ideas. OpenWhisk supports several languages via its Action Runtimes, but there may be other languages you would like supported or even language variants with different frameworks for languages we support today. OpenWhisk is all about making it easy for ANY developer, using any functional language they are comfortable with, to develop Actions for our platform! This section has information that is primarily focused on deploying, configuring and administrating an Apache OpenWhisk Serverless platform. The diagram below depicts the high-level architecture of OpenWhisk. 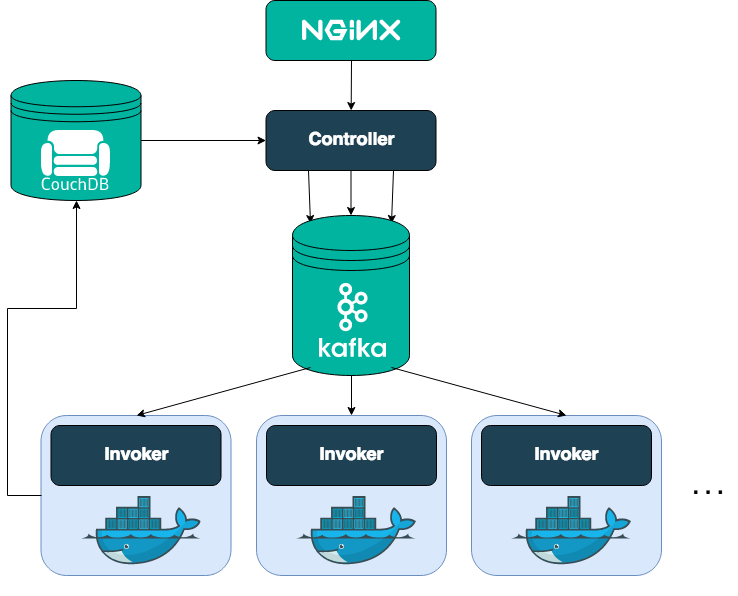 From Nginx to Kafka to Docker, multiple technologies are powering Apache OpenWhisk which shows its committment to be a true Open Source Serverless Cloud Platform. OpenWhisk offers different deployment options for installing and configuring the OpenWhisk platform components. However, Kubernetes is the recommended option as it is supported on most major platforms and includes great options for local developers to get running quickly, as well as supports operators needing to manage large scale production deployments. OpenWhisk can be deployed using Helm charts on any Kubernetes provisioned locally or from a public cloud provider. Please refer to: Deploy OpenWhisk to a Kubernetes Cluster for detailed deployment instructions which includes specific customizations including Docker Desktop (Mac, Windows), Minikube, Google, IBM Cloud, IBM Cloud Private, etc.). If you like using Docker directly, another easy local alternative is to get Docker installed on Mac, Windows or Linux and use Docker Compose. Please note that this option does not give you a production deployment but gives you enough of the pieces to start writing functions and seeing them executing. For more detailed instructions, see the OpenWhisk with Docker Compose project. Deploying OpenWhisk using Ansible is a more imperative, script-based deployment option such as in a CI/CD (Travis) pipeline. The OpenWhisk playbooks are structured such that it allows cleaning, deploying, or re-deploying a single component as well as the entire OpenWhisk stack. A Vagrant machine is also available to run OpenWhisk on Mac, Windows PC or GNU/Linux. Downloading and install VirtualBox and Vagrant for your operating system and architecture. You can follow the steps under Vagrant Setup to run your first OpenWhisk action using Vagrant. Deploy OpenWhisk to a Mesos Cluster is under active development. OpenWhisk Deployment on OpenShift is under active development. This section contains a list of resources which can be utilized to administer the running OpenWhisk instance. Awesome OpenWhisk - list of OpenWhisk resources and tips including articles, books, videos, presentations, podcasts, etc. If you are interested in contributing to OpenWhisk project, please join openwhisk mailing list and reach out to other whiskers. How do I report a problem with this site or suggest an improvement? You can submit an issue to the GitHub repository for this site. You can also submit a pull request if you have signed the Apache ICLA. Apache OpenWhisk, OpenWhisk, Apache, the Apache feather logo, and the Apache OpenWhisk project logo are either registered trademarks or trademarks of The Apache Software Foundation in the United States and other countries. See guidance on use of Apache OpenWhisk trademarks. All other marks mentioned may be trademarks or registered trademarks of their respective owners. Apache OpenWhisk is an effort undergoing incubation at The Apache Software Foundation (ASF), sponsored by the Incubator. Incubation is required of all newly accepted projects until a further review indicates that the infrastructure, communications, and decision making process have stabilized in a manner consistent with other successful ASF projects. While incubation status is not necessarily a reflection of the completeness or stability of the code, it does indicate that the project has yet to be fully endorsed by the ASF. Copyright © 2016-present The Apache Software Foundation, Licensed under the Apache License, Version 2.0.